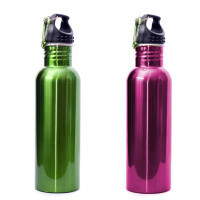 Home » Nutrition » Kids Nutrition » Should Kids Have Sports Drinks During Physical Activity? There is a relatively straightforward answer to this question. For kids who exercise for less than 60 minutes at a low-moderate intensity (brisk walk, bike ride, jump rope) water is the perfect hydrating source. Only when you are involved with 60 minutes or more of intense physical activity (cross-country running, tennis, soccer), sports drinks can become needed to replace the sugar, electrolytes, and water lost during the exercise. Bottom-line, the average child is not working out hard enough to need the rapid refueling these sports drinks provide. The reason sports drinks should not be given to the average child is that they are meant for athletes; this is why they are called “sports drinks.” Sports drinks contain specific nutrients such as carbohydrates, sodium, and potassium that are only needed if athletes exercise intensely enough to lose them through heavy sweating. Sports drinks as typical exercise beverages will not help and can hurt – remember they are packed full of carbohydrates that come as sugar in addition to extra sodium that kids or teens really do not need. For the average child or teen soccer player, then, providing an ice-cold glass of water along with a healthy snack like a granola bar will keep him or her hydrated, safe, and performing at his/her best! « National Childhood Obesity Month – Let’s Make it Obsolete! Comment on Should Kids Have Sports Drinks During Physical Activity?